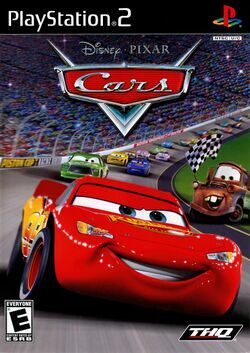 Cars is a game for most consoles and is based on the Pixar movie Cars. The game is set after the movie, and the main storyline being that Lightning McQueen must win lots of mini races to train for the next season of the Piston Cup. Many characters from the film are back, and there is also a variety of new folk who are willing to take on McQueen. There is also a two player mode, in which players can challenge a friend to any races or minigames they have already unlocked. You can drive freely around Radiator Springs, Ornament Valley and Tailfin Pass whilst not in races, but the last two have to be unlocked by winning a certain race. This page was last edited on 13 July 2017, at 08:06.